Which Counter Material Is Better, Corian or Granite? Corian countertops or granite countertops? If you've narrowed down your options to these two premium materials, there are plenty of factors to consider before making your final decision. Here's a look at the most important characteristics of each. Corian is DuPont's brand name for its flagship solid surface countertop material. It is a man-made product composed of 33 percent binding resins and 66 percent minerals. Corian was the original solid surface brand name. First developed by DuPont in 1967, solid surface countertops are now made by several other manufacturers and include the brands Avonite, Staron, and Mystera. Granite is real stone. It is granite quarried directly from the earth, sliced into slabs, honed, and polished. Nothing is added, nothing is removed. While the term "granite" often is used to refer to other stone-based counter materials, such as quartz or engineered stone, these are not the same as slab granite, which is simply solid stone without additional materials. Slab granite typically is not associated with specific brand names. The costs of Corian and granite countertops are pretty comparable. Both are commonly priced in the range of about $40–$65 per square foot, installed. Keep in mind that this price is for slab granite, not granite tile. Tile can be much cheaper and offers the option of DIY installation (for further savings), but it also means grout lines, which, for kitchen countertops, should be avoided at all costs. Beauty is in the eye of the beholder. Most people love the look of natural stone, with its color variation and deep luster, but that doesn't mean everyone wants that look in their kitchen or bathroom. The mottled and often bold coloring of granite can be a bit too busy for many decorating schemes. More notably, all that color can do an annoyingly good job of hiding crumbs and smears on the countertop surface; often a granite top looks perfectly clean when it's anything but. On the flip side, granite looks beautifully natural, while Corian looks like plastic, or at least something not natural. That said, it doesn't have the plasticky shine of a laminate countertop but rather a soft color that somehow has depth despite its total consistency. Granite is commonly claimed to offer a high return on investment when it comes time to sell a house. Note that slab granite—as opposed to tile—will give back the highest amount. But Corian is no slouch, either. Of all solid surface countertop materials, Corian is the one with the greatest consumer name-brand recognition. Again, beauty is subjective, and potential buyers may consider your choice of material or color either an asset or a liability, and of course, you can't control that. 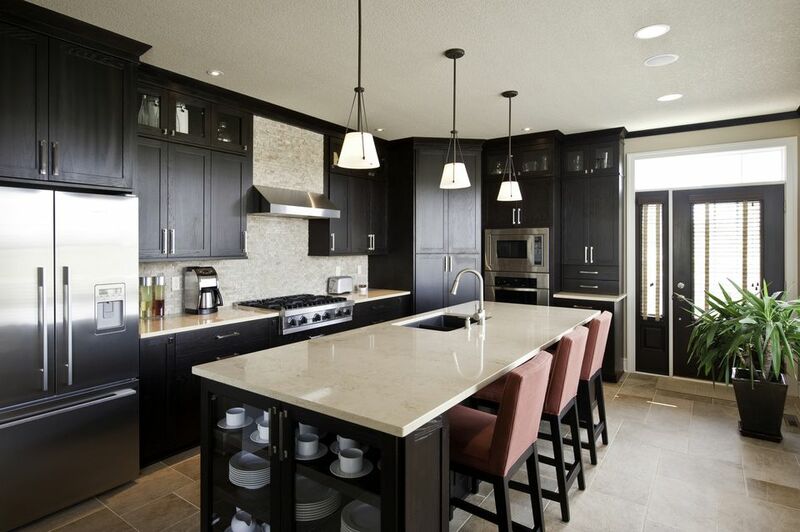 Granite should be sealed every 1–2 years to minimize the risk of staining. Yes, granite can stain, but so can Corian. Corian never needs sealing. Both materials are essentially nonporous and are considered highly hygienic surfaces and easy to keep clean (unlike grout lines in tile, for example). Granite is susceptible to etching from acidic materials, such as lemon juice and vinegar. Corian has no similar chemical vulnerabilities. As for heat-resistance, granite wins hands-down. You can set a hot pan on it without worry. Corian can be scorched by hot pans, requiring the use of hot pads, trivets, or cutting boards to protect it from extreme heat. Finally, granite is hard to scratch or damage with knife blades. Corian is fairly easily scratched, but minor scratches—and many other blemishes—can be buffed out with an abrasive pad. Both granite and Corian should be professionally installed. However, Corian is much more forgiving material that can be worked in many different ways and is lighter to carry. While most homeowners do not choose to install Corian themselves, it can be done. Resellers offer full and partial slabs to homeowners. Corian can be cut with an ordinary circular saw, and sink cutouts can be made with a RotoZip or router. Corian is installed with seaming materials that are perfectly matched to the product so that ​the seams completely disappear. Seams in granite aren't always obvious, but the color variation of each piece often creates a visible seam, even with a skilled installation.